Dubai: At midnight on Christmas Eve in 1985, the atmosphere in St Marks Cathedral in central Cairo was electric. The huge concrete cathedral housed a vast congregation of over 6,000 Copts who were desperate to see their leader, Pope Shenouda III who had been released from more than three years of internal exile just a few days earlier. The Copts are a tight-knit Christian community who make up around 10 per cent of Egypt’s population. Pope Shenouda had quarrelled bitterly with the previous President, Anwar Sadat, over what he saw as an inadequate response by the government to growing Islamic radicals, and over the Camp David accord with Israel, which the Pope described as treachery. Sadat had taken the bizarre step of deposing the Pope and forcing him into internal exile in the remote Coptic monastery of Deir Bishoy, in the desert of Wadi Natrun between Cairo and Alexandria. On January 2, 1985, the new president, Hosni Mubarak, reversed his predecessor’s decree, and Pope Shenouda came back to Cairo to celebrate the Orthodox Christmas on January 7. 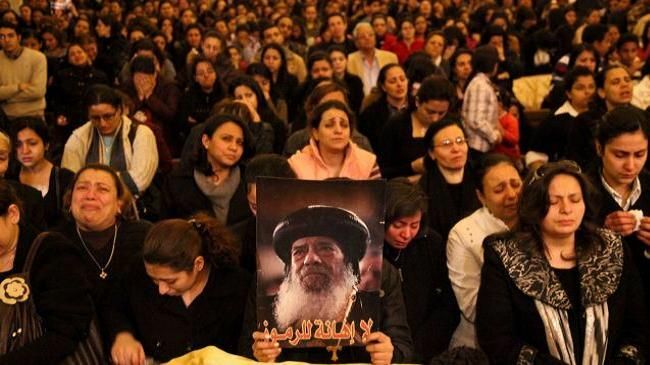 The Coptic church had never accepted the president’s decree, and if Pope Shenouda had mounted his pulpit that January night to call on his people to seek revenge for the insult to him as pope and to their church, millions of Copts would have taken to the streets to burn and loot government offices and Muslim sites. I was a foreign correspondent in Cairo at the time, so went to see what would happen. I went to the cathedral in north Cairo’s Abbasiya district, and joined the dense throng. It was only when we entered that I realised that the congregation was split with women on the left and men on the right, and that I was in the wrong area. As I paused in some confusion, a sidesman took pity on me since I was clearly not a regular attendant, and ushered me forward. I was not able to slip into a back seat but had to march up the centre of the cathedral to the reserved seats at the front. A few rows in front, I saw several dignitaries like the Governor of Cairo (a Muslim attending out of communal duty), and Boutros Boutros-Ghali (head of one of the leading secular families of the Coptic community). After a long wait, complete silence reigned. Then the vast doors were opened and a long procession started down the nave of the cathedral. As the pope came into view, the entire crowd erupted. All the men were cheering and shouting, and the women were giving their ear-piercing ululations. The intense feelings of the repressed Copts were let loose as they welcomed their 117th Pope back to Cairo and into his cathedral. The congregation surged forward, and the pope’s procession was only able to keep going as very strong monks linked arms and forced their way through. Once they got to the front, the Pope took his place and the service started. His insistence on peace within Egypt was a vital factor in calming Coptic fury, and had a powerful effect on the hotheads who wanted to seek revenge. At the time, the present Islamisation of Egyptian politics was far into the future, but specific mosques or government offices could have been targeted, leading to widespread communal rioting and violence on an unprecedented scale. The ability of Pope Shenouda to look past Sadat’s insult to him and his office was an important instance of his ecumenical and outward-looking attitude on many other matters, which helped keep Egypt calm for many decades.